Throughout fiction, lore, art, and film media, the darkest arts of magic are steeped in blood an death. What motivates these people (beyond psychosis) to perform horrific acts? How do such atrocities as blood sacrifice become an acceptable option? Those questions (and others) were in my mind as I was writing up the material for Whispers of Persephone. I wanted to present a source book with reasons for those evil activities we so often associate with the dark arts. Far too often I have heard players proclaim that they are committing some atrocity because "I'm evil". With Whispers of Persephone, I wanted to give players something concrete for their characters to use in justifying their sins. One of the main themes I dealt with was death. Given that Whispers of Persephone is a source book on Necromancy, I wanted to incorporate bloody rituals and thematic elements steeped in the taking of life. I felt that magicians would need something to reward these practices or why else would they bother with them? So I contrived, designed, and wrote to such elements as ritual groups, blood sacrifices, creation of wretched magical items, foul potions and poisons, and rituals that garner power for those magicians willing to perform them. Throughout all of this content blood flows from victims of the magician's evil. Power is there to be tapped in the blood and suffering of victims. Evil rises in the magician's dark heart. What does Whispers of Persephone bring to your 5th Edition game? The Stygian Necromancer arcane tradition: For this new tradition we drink deeply from the darkest of topics. This tradition requires commitment to performing rituals of sacrifice to empower the magician. The blood of victims is used to anoint the magician in death as they rise to power. Souls are sacrificed to dark entities to fuel dread magics. The blood of victims is used to scribe potent spells. Lives are traded for arcane power. This is the path of suffering and death that the Stygian Necromancer walks to increase her magical might. New Feats: New feats are defined which afford the magician a variety of special abilities to aid them in the quest for power. Do you wish to be master of ritual sacrifice, a savant of poisons, or will you reveal in the blood of your victims and devour every ounce of magical potential from the end of their lives? Be unique in your mad quest for power. New magic items: Created through terrifying processes, the magic items described within Whispers of Persephone are potent tools in the necromantic arsenal. Whether you are using ghost dust to control a pestiferous spirit or using your athame to carve out a sacrificial victim's heart, each item carries a fell purpose. Your Stygian Necromancers can learn the formula for creating these cursed items as they grow in knowledge and power. 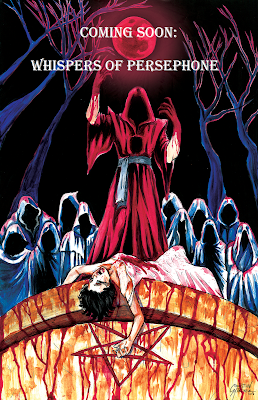 Woe unto your victims as their blood fuels the magic for these wretched creations! New alchemicals, poisons, and potions: Whether you are serving Ild's tea, or using a potion to hide your life force, these concoctions open new avenues through which your character can achieve his goals. Expand your knowledge and garner power. New rites and rituals: Master the rituals of blood sacrifice, gain new abilities, and summon forth arcane forces the world was never meant to endure. These rites and rituals are not simple spells to be cast and forgotten. No, these are workings of deep magic that invoke forces of death and touch the soul. Your enemies will cringe at the power of these workings and you will revel in their darkness. New Spells: Within the blasphemous pages of Whispers of Persephone lie potent spells waiting to be unleashed upon the living. Spells of all levels are to be found within this tome, written in the blood of hundreds of victims. Rip the life from your enemies, punish the vampire who does not wish to bend his knee in service to your might, or lay waste to the world with the Curse of Necromantic Contagion. Dark magic lies at your fingertips within these blood stained pages. I hope game masters and players alike will find tremendous use from this little bloody book of necromancy. Evil lies at the heart of Whispers of Persephone, a terrible darkness filled with the cries of victims, and fed by the darkest of arts. For more information on my little bloody book of necromancy or its coming KickStarter campaign, follow the links to the Whispers of Persephone page. You can also listen to some of the spoilers I released concerning Whispers of Persephone during a podcast interview for the Darkslinger Mafia Podcast (that interview promoted The Steel Road, but we spoke at length on a number of projects). I update the Whispers of Persephone page as new information becomes available. For my fellow game designers, writers and self-publishers: This is another project that will require a substantial amount of art. With designing a book like this it is important to look at the layout of the book and to fit your art with the content it will compliment. To that end, I charted a bare minimum of art based upon page count, and arranged the commission of that art with Christian Martinez. Additional art will be created so long as the KickStarter campaign can reach particular stretch goals. When calculating the crowdfunding goal, total your costs and look at how you will meet those costs based upon the audience you are anticipating and the best value you can offer the backers. Remember to create value for your backers. They are your audience. So for the KickStarter campaign for Whispers of Persephone I've been looking at a number of options for fulfillment. I want to keep the value to the backers high, the costs of processing fulfillment low, and generate ample revenue for art and printing. Of note, I would like to realize a profit on this project so I can put more money toward my first comic book, 47 Furious Tails (my retelling of the Ako incident). This is so I can make the crowdfunding goal for that project substantially lower (comic books are expensive to produce when you aren't creating the page art yourself). As a side note: I've been seeing a LOT of ads on social media from products claiming that you don't need to build an audience in order to sell your books. While I cannot speak to the efficiency of such claims, I do want to weigh in. If you have created an audience by producing the best product you can at the best value possible to your audience then it becomes easier for you to crowdfund your projects. This isn't speculation, this is a direct observation of my own experiences. After putting out three adventures, it was far easier to fund The Steel Road (even though the video became corrupted and we couldn't use it). There were no paid adds for The Steel Road. We depended entirely upon the strength and support of the audience to propagate the social media attention. Could a paid ad campaign have made a difference? Probably. Was it within the budget? Nope. What I want to stress is that, though I've had some limited success in getting books out into people's hands, it has been success. While 200 copies may not sound like a lot to move through KickStarter compared to giants like Kobold Press and Green Ronin (I'm huge a fan for both companies! ), its a start. One year in and I've already met some really nice people who have been kind enough to support my projects. I'm looking forward to putting more books into their hands, and I'm working hard to make each better than those that came before them. To my thinking, my audience isn't a money machine. They are people. People who have been kind enough to support my work. People who have enjoyed what I have offered. People who have offered their criticism and compliments. These are people who I look forward to meeting at conventions one day. I smile when I see familiar names backing one of my projects. I laugh with many of these folks during my KickStarter live streams (I don't do the streaming thing well, but I have fun with them). Those interactions are priceless. So, if you can sell your products without building your audience that is great. I wish you great success. I will continue to grow my audience, as best I can. Who knows, maybe one day Sinopa Publishing LLC will be recognized like the small press companies I admire. What I do know, is that I'll keep creating and publishing for my own enjoyment and for the joy of my audience. So for all of you who have supported my projects, who have enjoyed the books I've produced, who have offered criticism and compliments alike: Thank you! Thank you for joining me on my adventure in game design, writing and self-publishing. I hope that this blog continues to offer insight into my experiences. This entry focuses a lot on promoting Whispers of Persephone. I do this in an open and honest manner. I don't sugar coat it or try to over-hype. I believe that honesty is key to creating a trusting relationship with your audience so I am careful to create such posts as representative of the content. I invite you do to the same with your audience. The opinions I offer on audience building, paid advertising, and other issues are my own opinion. I invite you do your own research, as I could be incorrect. Yes, I can be wrong. So do your due diligence, do your research, read up from multiple sources and make your own determination. I wish you the best of success in your own creative endeavors. That your books will be widely read and enjoyed, your games played by many people who get great enjoyment from them, and that your publishing brings you financial success and great value to those who buy your products. I hope to see you next time as we continue this great adventure!